The Eastleigh v Chelmsford City Skrill South fixture was postponed at 2.15pm by match referee Chris Powell. The referee gave all chances possible to try and get the pitch playable to the band of Eastleigh workers who had tirelessly continued to work on the pitch but with another downpour at that time, the decision to postpone the fixture was given. The revised date for the fixture should be in February. 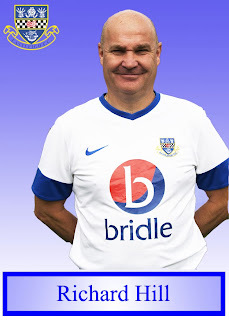 Eastleigh FC are delighted to announce that first team manager Richard Hill has signed a contract till the end of next season with an option to extend for a further twelve months. Eastleigh Chairman Stewart Donald commented: "As a board we are very pleased to have been able to secure Richard on a contractual basis. "It is no secret he has been attracting interest from other clubs higher up the pyramid. I am not surprised this is the case and shows what positive impact he has had in his first twelve months. "It was an easy conversation as Richard had no desire to leave. He did not negotiate or try to get an improved deal despite knowing there was interest in him, which speaks volumes about his character. "We have a great working relationship and do not need a contract, but it will hopefully settle a few people down around the club who were concerned that there was no formal agreement. Eastleigh have been drawn at home to fellow Skrill South side Dover Athletic in the Third Round of the FA Carlsberg Challenge Trophy. The game will be played at The Silverlake Stadium on Saturday 11th January at 3pm. The winners purse for the tie is £7,000. The eagerly awaited clash with current Skrill South table toppers Bromley and ourselves, originally scheduled for Saturday 14th December now has a new date. Bromley v Eastleigh has now been postponed following our success at Bury Town yesterday in the FA Trophy (the Second Round of which is played on 14th December), and has now been rescheduled for Tuesday 28th January at 7.45pm. The draw for the Second Round of the FA Trophy is made at lunchtime tomorrow (Monday 2nd December).